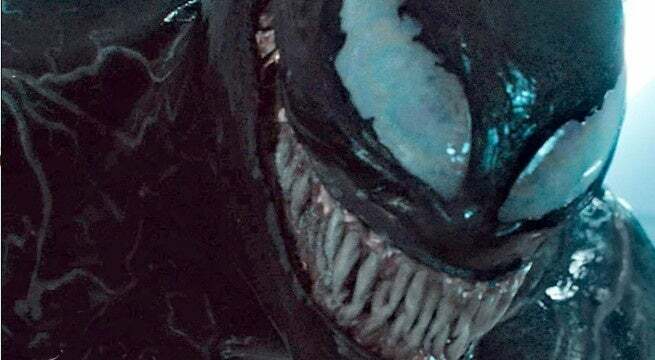 Sony's Venom has a brand new trailer, and for the most part, it seems to be getting a positive reaction. 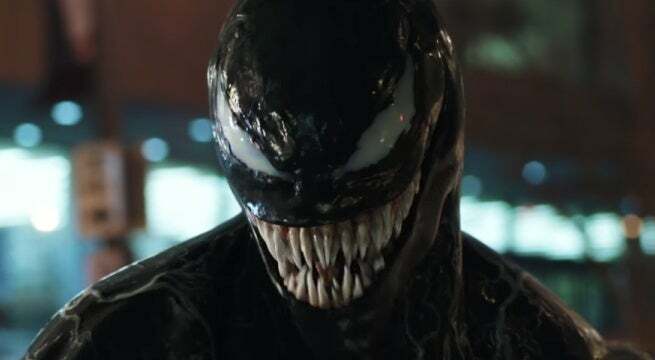 The new trailer features an array of first looks at the other big characters, like Riot, Toxin, and Scream, and also presents plenty of footage aimed at conveying the film's morbid sense of humor. Most of that comes from the film's star Venom, caught between his human form of Eddie Brock and his new symbiote partner. The trailer also features some big action set pieces, including one particular one on one symbiote fight that is likely part of the film's climax. Unfortunately, it doesn't look like Spider-Man made it into the cut, but there's always a chance he could show up in the post-credits sequence. Not having him there though did help director Ruben Fleischer in his approach to Venom. "I'm a huge fan of comic book movies so I just tried to pick a lane that was true to the character," Fleischer told ComicBook.com in the video above. "I think inherent to the character, he's just darker, and we talked about more violent. It's just tonally different from everything else, especially when you're focusing on just Venom. He's not a sunshine kind of guy. So, it takes place at night. It's darker. More menacing. I think that within the spectrum of all these movies, there's the DC super dark, Zack Snyder type version and then there's the Marvel movies and I like to think that we're in our own zone apart from that." Venom will put Tom Hardy in the role of Eddie Brock, a reporter who is investigating the Life Foundation, a business associate of his girlfriend Annie, played by Michelle Williams. The Life Foundation's leader Carlton Drake (played by Riz Ahmed) reveals they discovered an alien life form called symbiotes that have the ability to bond to human hosts. Unfortunately for Eddie, one ends up bonding to him, but he soon learns it is sentient, and when it takes over he becomes the lethal protector Venom. 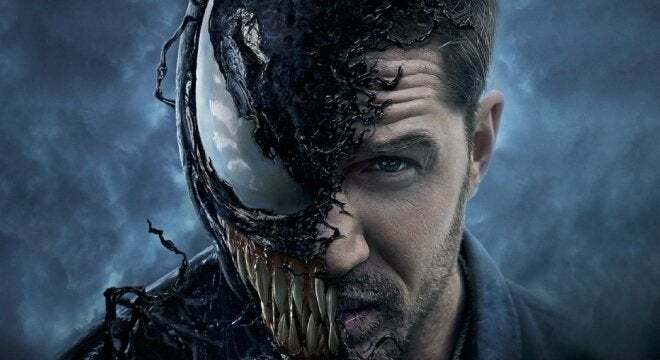 Venom stars Tom Hardy (Eddie Brock), Michelle Williams (Anne Weying), Woody Harrelson, Riz Ahmed (Dr. Carlton Drake), Jenny Slate, Scott Haze, Michelle Lee (Donna Diego), Wayne Pere (Dr. Emerson), Christian Convery (Joey), and Reid Scott. Hit the next slide to see how the fans are reacting! That last scene gave fans a great feel for the tone of this movie, a mix of brutality and morbid humor. Take for instance that line "like a turd, in the wind", followed by a detailed description of the unfortunate future of this thug. “...like a turd, in the wind” @VenomMovie #Venom #VenomMovie #VenomTrailer ? Venom isn't being marketed as a superhero, and that's perfectly fitting for the character fans have gotten to know in the comics. Sure he does semi-heroic things every now and then, but no one is about to get him confused with Spider-Man. Though, not having Spider-Man in the film at all is unfortunate. #Venom himself looks and acts almost identically to what I've always wanted a live action Venom to be. Well, aside from the lack of Spider-Man connections. But I can overlook that. "#Venom himself looks and acts almost identically to what I've always wanted a live action Venom to be. Well, aside from the lack of Spider-Man connections. But I can overlook that." One scene in the trailer gives us a look at what appears to be the climactic final battle, where Riz Ahmed's Dr. Carlton Drake gets a symbiote of his own and goes toe to toe with Tom Hardy's Venom. It's rather stunning, and to some has similarities to a gorgeous painting. "Also this shot from the #Venom trailer looks like a renaissance painting and I'm DEFINITELY into it"
Slide 4 of 10We Are Venom! The trailer doesn't skimp on the fanservice, especially in that final scene, which gives Marvel fans a pitch-perfect "We Are Venom" line. It's not just the line that sells it though, as Venom's face melts away to reveal Hardy underneath as he delivers the line. Chills man, just chills. "We are Venom!! This looks so freaking sweet #Venom"
Most superhero trailers these days feature a humorous send-off at the end, seen in other trailers like Wonder Woman (trying on dresses) and Avengers: Infinity War (Doctor Strange meeting Spider-Man), and Venom is no different. While it is humorous though, it does keep the tone from the rest of the trailer. "I rarely laugh at the obligatory joke at the end of a superhero trailer (trend I noticed with WW) - except honestly with #Venom I chuckled aloud for a good minute"
During one symbiote vs symbiote fight, you can see a hulking Riot taking on Venom, but Brock's symbiote is struggling to stay around him, revealing Hardy's face underneath. The CGI looks pretty impressive so far, and to some, it is even breathtaking. While most of the reactions have been positive, there are still some that aren't completely thrilled with what they've seen so far, and still have no expectations for the film as a whole. "I’ll definitely see this because Michelle Williams, Riz Ahmed, and Tom Hardy. But I don’t have any expectations. Others feel they've seen the inspiration for Venom's face and head somewhere else, namely a television series from Stephen King himself, one titled The Langoliers. It's actually a pretty great comparison, and the Langoliers are still creepy as all get out all these years later. You knew there would be at least one Spider-Man 3 comparison, which originally debuted the Venom character on the big screen. Unlike that film, this one goes all in with the symbiote, and it appears that approach is paying off. "The new #Venom trailer is freakin amazing!! The detail they gave to the new symbiont suit makes the one in Spider-Man 3 look like garbage. Can’t wait for October 5th!! @VenomMovie"
Most can agree that the visuals in Sony's Venom are pretty on point so far, but there are other areas that could prove to be a problem. The the question is then can one hold up the other? - When in doubt, trust Tom Hardy + Michelle Williams. Bbbuuuttt...if the small sample of dialogue are indicative of the whole--we may be in trouble. Can an iconic character and great visuals trump a weak script? Can an iconic character and great visuals trump a weak script?"